Trinidad Scorpion, also known as Moruga Scorpion, is named after the location it originated from Moruga, Trinidad. 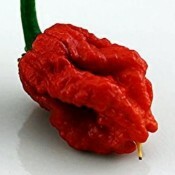 One of the world’s hottest peppers, Trinidad Scorpion tops the charts at a bewildering 2,000,000 Scoville units. A jalapeno comes in from 2,500 to 10,000 Scoville units. The immense heat kicks in and lingers on after the initial tasting. Growing tip: depending on the area pollinator population, pollination by hand may be needed. Watering less during the fruiting stage will produce smaller peppers but it will increase the heat. When they are ready to be harvested, these wrinkly skinned, latern-shaped peppers with scorpion tails will ripen from green to a striking red. Use a sharp knife or pruning shears to snip off peppers leaving a short stem attached. Please note: ALWAYS wear latex/nitrile gloves when handling these peppers and avoid contact with face and eyes. Keep out of reach of children and pets.